I didn't write about it at the time, but I had two mechanical problems with the Rolling Stone during my last stint in the Bay Area. Both were fortunately not total show-stoppers, but they were annoying, and they needed to be fixed. About halfway through the two-week stint, the toilet stopped flushing. 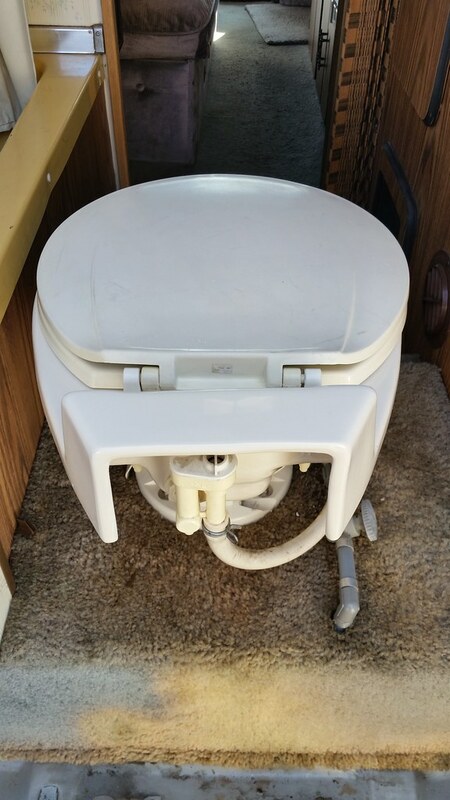 The RV toilet is a gravity-feed type, where a foot pedal opens the trap to allow waste to fall into the holding tank. (It also operates the pump to put water into the bowl.) One night, something gave way and the trap would not open. 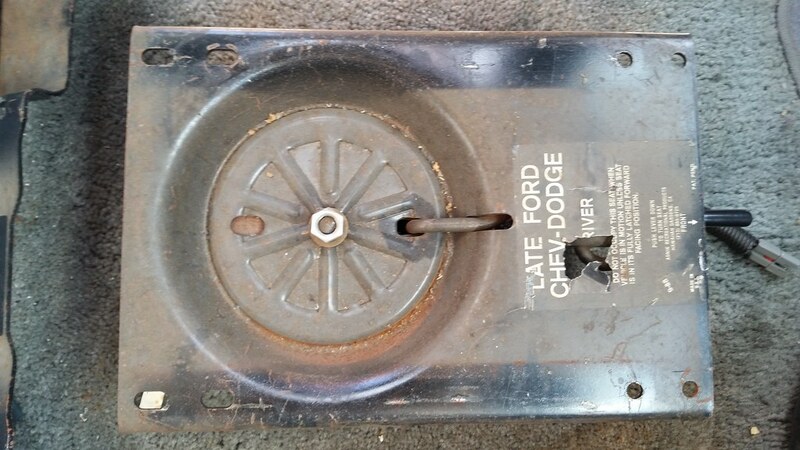 Now, fortunately for me, the trap already had a slight leak and if you carefully pushed on the lever, you could get it to open just slightly, so liquids could drain, and for the rest of my trip I was able to limit the use of it to liquid waste. The photos below are not in the order I took them (more the opposite) because it makes it easier to describe what Lisa did to fix things. With the rear doors of the RV open, there's easy access to the toilet. When Lisa removed the base assembly, it looked like this underneath. 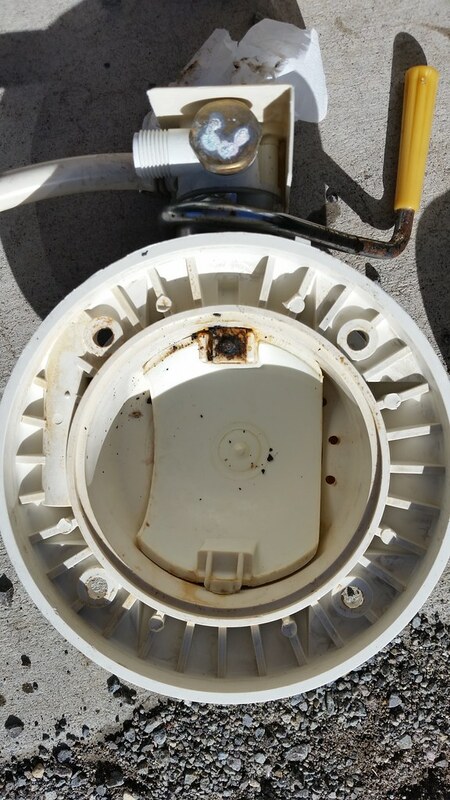 The large brown spot is a rusted-out screw that attached to a plastic assembly that in turn attached to the flush cover. The screw was so badly rusted that Lisa could not remove it. After trying several different things, she gave up and said we needed a replacement. She figured out what the Sealand/Dometic part number was by online searches (something I hadn't managed to do), and we called Safari RV in Reno to see if they had the part, which they did. We headed into Reno late yesterday afternoon to get the part. 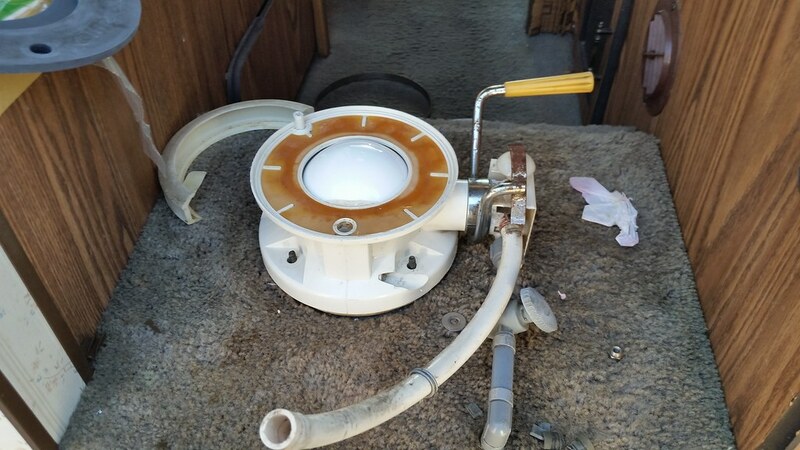 Safari RV wanted to sell us a whole new toilet, but Lisa didn't want that, because she understood how to fix the existing one, and besides, a new toilet would require an adapter kit to fit to the older-style floor studs in the Rolling Stone. We got a new ball valve assembly and a new rubber seal, for a total cost (with tax) of about $108. This afternoon, with a spell of good weather (no rain, high of 15°C), Lisa tackled the repair. Here is the old part and the new side by side. The small round piece with a square head fits into the slot on the left of the ball valve. You can see how badly corroded the old part's screw was. Lisa was very impressed that the replacement part is brass (including the screw), replacing a plastic part, rather than the other way around as it seems is usually the case. 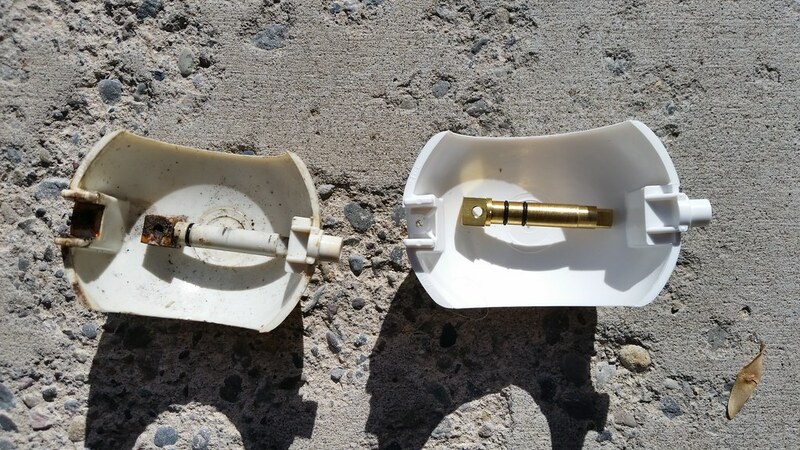 While Lisa put various parts together, I took the opportunity to clean the toilet parts more thoroughly than they probably every have been cleaned since the toilet was originally installed. (It's much easier when the pieces are disassembled!) Lisa cautioned me to not drop the bowl, as we would have to buy a new toilet if I did that. With everything cleaned up, Lisa reassembled the toilet, and everything works just as it should be; indeed, it works more smoothly than it did before. Besides the toilet issue, the driver's seat had developed an alarming amount of wobble during the two weeks. When I described it to Lisa, she told me to stop turning the driver's seat at night (I get more legroom while sleeping when I do so) and she tackled that issue this afternoon. 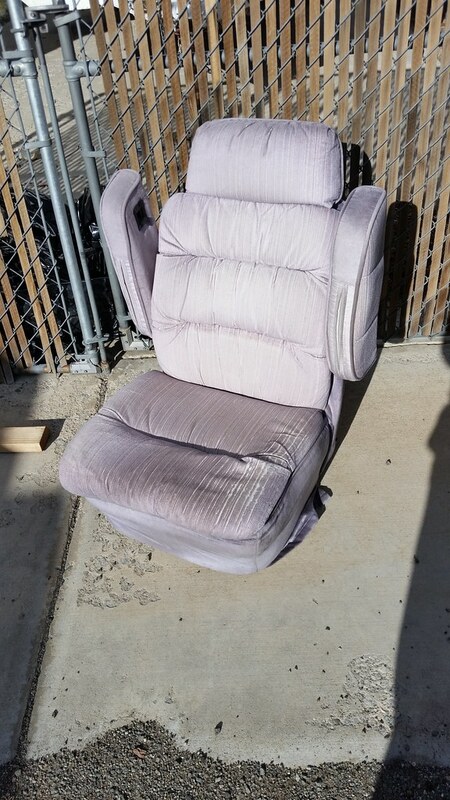 Lisa unbolted the seat from the pivoting pedestal upon which it sits and I lifted it out of the RV and set it aside on a patch of the carport. 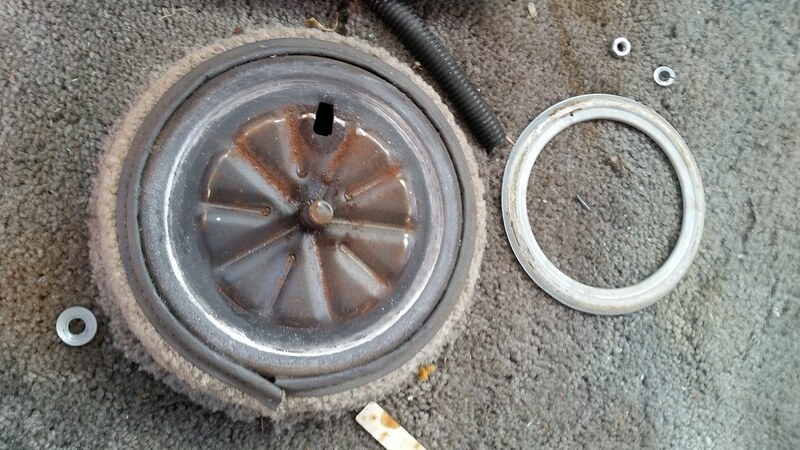 The center locking nut here had started working itself loose, which is a Bad Thing. Lisa removed the lock nut and we went to Big R to buy a new one, and also a couple of other nuts and washers she wanted to replace on the seat assembly, plus a can of thread-locker. Total cost $6.75. She also cleaned out and greased the seat mount, where the round assembly seen at right here sits between the base and the seat where it rotates on the mounting. Lisa put the pieces together, spread thread-locker on the main bolt, installed the new locking nut, and with some help by me lifting the seat back into place, reinstalled the driver's seat. I'm very relieved that we have the driver's seat not wobbling around as I drive, and that the toilet is working again. I'm also relieved that the total cost of the repairs was relatively low, and is "paid back" with two nights sleeping in the RV rather than staying in a motel when I'm working in the Bay Area. Now if only the building security at the two offices at which I work would change their minds about people sleeping in their vehicles overnight.